My green crops are having a heck of a time staying perky and fresh at the farmstand. After I harvest them, early in the morning, and put the bundles in cool water, they still look wilted by noon. How do the grocery stores keep their greens so crisp? Misting and refrigeration no doubt … and that’s not going to happen at my farmstand anytime soon. Our challenge today is “how to utilize greens that are not so crisp”, so that we do not waste any food. The number #1 answer is to use the greens as soon as they are harvested. ie. only cut what you need, when you need it. The number #2 answer (which is necessary far more often, in my opinion) is using different methods of preservation … and then consumption. Let’s face it, by the time our green crops come into full harvest, we’ve already eaten them for weeks as breakfast (smoothie), lunch (salad) and dinner (slaw, sauteed, steamed, stir-fried). Just call me Kermit. 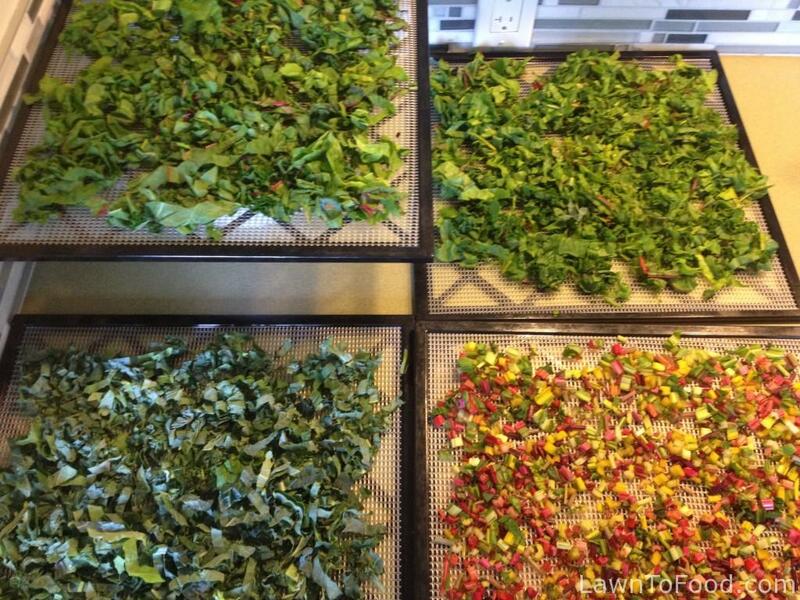 Dehydrating is quickly becoming my food preserving method of choice. It is so quick, easy to do and then easy to use. This morning I turned a bundle of farmstand wilted greens, that weren’t sold yesterday, into useable food that can be stored for months. We’ll use it when fresh garden greens are not growing in leaps and bounds (there’s that frog thing again?). I started by grabbing 4 dehydrator sheets, then separated the chard from the kale bundles. I stripped all of the swiss chard ribs, removed the dried ends and chopped them up finely. Such gorgeous colors!! I just love this stuff for it’s flavor and beauty. Next, I removed all of the ribs from the assorted types of kale. I don’t keep these ribs because they tend to be tough and chewy. Off to the compost bucket they went. 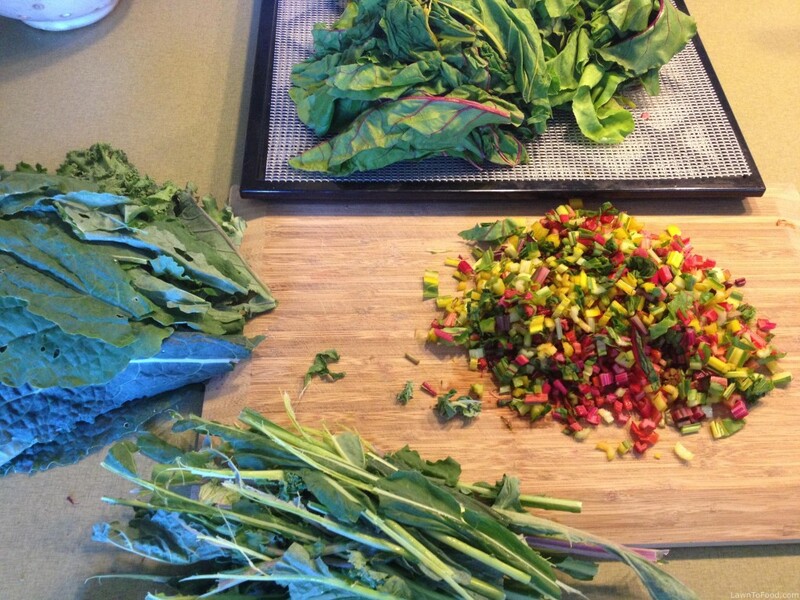 Not even 5 minutes later, I slightly chopped the swiss chard greens and spread them onto 2 dehydrator sheets. The same happened to the kale leaves, they were spread onto 1 sheet. 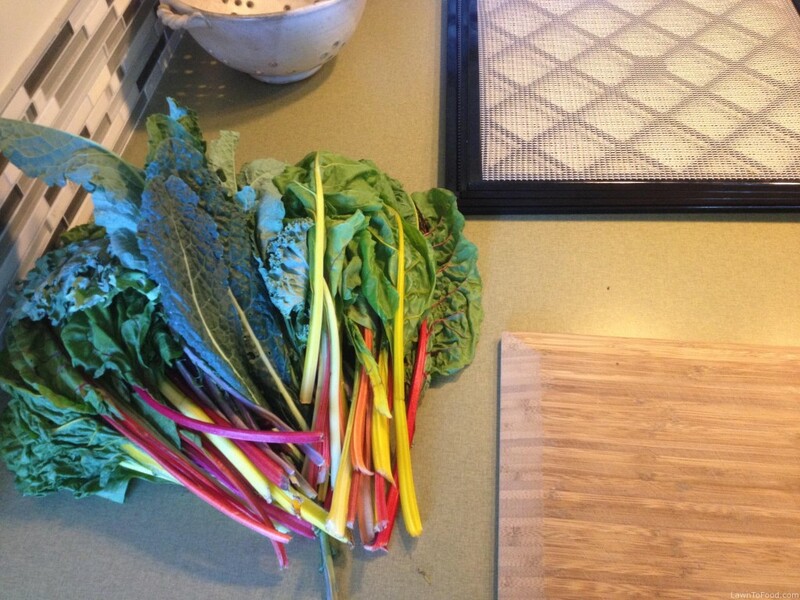 Lastly, 1 sheet for the rainbow of chard stems. All 4 sheets headed to the dehydrator at 115 F to keep the raw enzymes intact while removing the water content. 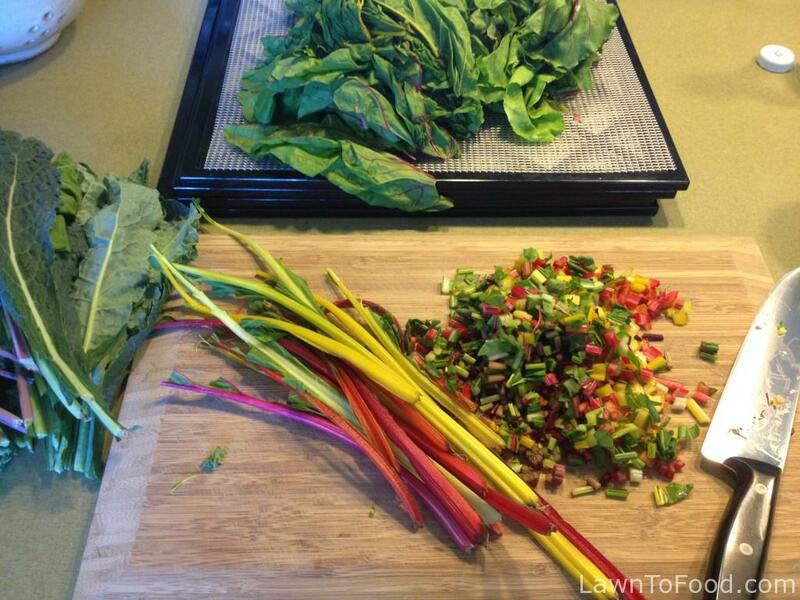 The chard stems will take a bit longer to dry than the leaves. I will put the dehydrated food into airtight containers and store them in our pantry. The dried greens are brilliant in morning smoothies, try a handful added to a Lasagna cheese layer, or handful into a “spinach” vegetable dip. The chard bits will go into soup, stew or coconut curries. Now is the time to reap our garden rewards, let’s get it preserved. This entry was posted in Fresh Vegetable Ideas, Let's Eat, Preserving & Using Preserves and tagged chard, dehydrator, greens, kale by Lynda. Bookmark the permalink.